Click on button below to download the ZIP file of Field Trip Guides. The 11th International Kimberlite Conference (11 IKC) is being held in 2017 which is the 50th anniversary of the discovery of the first economic diamondiferous kimberlite in Botswana, now the Orapa Mine. This anniversary will be celebrated under the banner of "50 Years of Diamonds in Botswana". This first and other subsequent discoveries paved the way for the industrialization of Botswana into the stable, wealthy democratic country it is today. The apex field trip for the 11 IKC, therefore, will be Field Trip 1: Desert Gems – Botswana’s Major Mines. Interestingly, the discovery of Orapa came 101 years after the first alluvial diamond was found in 1866 in South Africa, where the subsequent diamond discoveries also sparked the industrialization of South Africa. 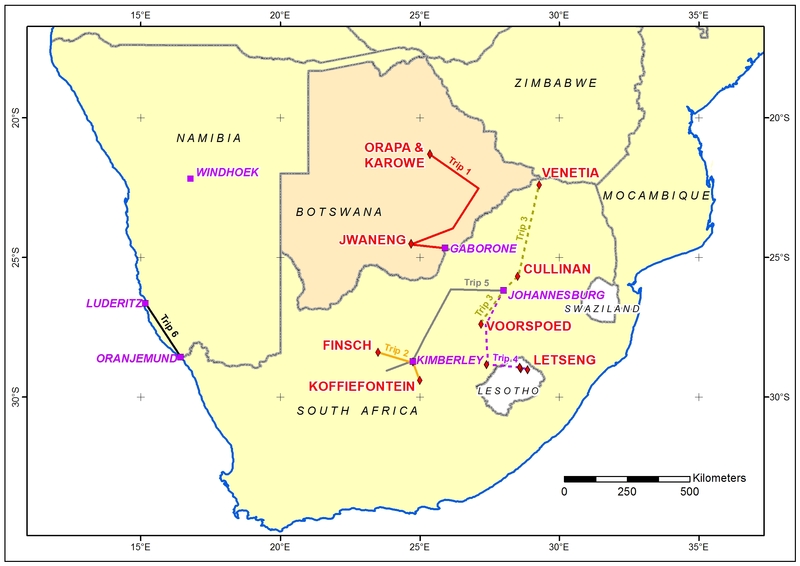 In addition to the Orapa Mine in Botswana, the first diamond mine discovered in each of the neighbouring countries will be visited on the 11 IKC field trips: the kimberlite mines in Kimberley, South Africa (Field Trip 2: First Gems), Letseng in Lesotho (Field Trip 4: Highland Gems) and Murowa in Zimbabwe (Field Trip 7: Zimbabwe Gems, which has now been cancelled) as well as the marine deposits at Elizabeth Bay near Luderitz in Namibia (Field Trip 6: Ocean Gems). Two other field trips in South Africa visit the main kimberlite mines (Field Trip 3: Highveld Gems) and the secondary riverine diamond deposits (Field Trip 5: Rivers that Sparkle). In addition, the field trips include the newest and only underground diamond mine in Botswana, the Ghaghoo Mine (Field Trip 8: Kalahari Gems - Botswana’s Newest Diamond Mine). Together the 11 IKC field trips offer the opportunity to visit all the diamond mines in southern Africa, both the primary and secondary diamond deposits. These are non-standard field trips which are not possible to undertake on an independent basis. There are a limited number of field trips spaces. Register early to reserve your seat. Field trip registration requires payment of 10% non-refundable deposit on conference registration and the full field trip registation fee. Field trip participants are required to pay the balance of their conference registration by 01 March 2017. The main field trips will be approximately one week in duration before and/or after the conference. Field Trips 1, 2 and 3 will be run twice, both pre- and post-conference. The remaining field trips will only run once, either pre- or post-conference. Single rooms will be provided for all field trips except in circumstances where accommodation is limited. Ground transport during the field trip is included in the registration fee. Transport to and from the start and finish points of each field trip is not included in the organisation or the cost of each trip. Delegates will need to make their own travel arrangements to the start and end points. 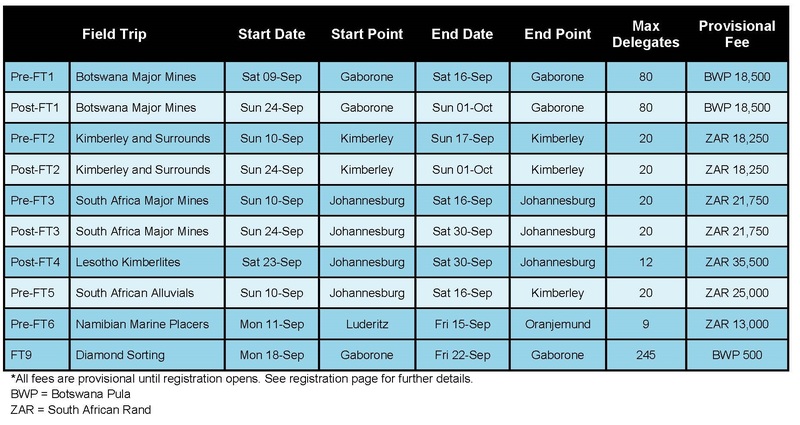 In addition, a number of day or part day trips will be run from Gaborone immediately before, during and/or after the conference. All persons undertaking field trips do so at their own risk. The information provided here summarises the current plans, but it should be considered as provisional. The website will be updated as new information becomes available. Field trip participants should anticipate being required to complete waivers of liability or indemnity forms as required by the properties visited. Participants will also be required to supply full names, age, gender, age and passport numbers with expiry dates, at the time of registration. Delegates must have their passport with them when attending all field trips to access the properties visited. The passport must match the details provided by the delegate during registration as these details were used to gain security clearance. Please note that there may be restrictions during field trips with regards to security, sampling, alcohol testing, photographic and other electronic equipment. Participants are expected to comply with the Semi-Precious and Precious Protection Act in the corresponding jurisdiction. Any diamond(s) found by field trip participants (pick-ups) remain the property of the host mine or project and should be handed to mine/project officials immediately. Field trip participants may have to undergo safety and security inductions prior to mine visits. Where sampling is allowed on field trips, there will be an opportunity to pack and courier samples at the end of each trip. The Organising Committee is intending to obtain sample export permits for each delegate to export the samples collected in, and exported from, Botswana, South Africa, and Lesotho. These export permits will not cover any samples collected other than on that particular field trip. In particular, participants should not transport samples between any of these countries. In order to be able to attend the field trips, delegates and accompanying persons must sign and submit to the Conference Secretariat the 11 IKC Liability Waiver and Consent Form by 01 March 2017. Please refer to Important Dates and Registration pages for additional information. The climate in Botswana and South Africa in September, which is spring in southern Africa, will be mild to warm, and in parts hot. Generally there is little or no rain in September in Botswana, South Africa and Namibia. Much of the Lesotho field trip will be at 3000m above sea level where rain often occurs, and although unlikely, snow is possible. A warm jacket is advised especially for those going to Lesotho. The field trips are in September, which is spring in southern Africa, and mosquito activity is generally low. It reaches its peak in the summer months of November through to February. For Field Trip 1 in Botswana, the area that is considered high risk for malaria includes the Orapa, Lethlakane and Karowe Mines. In these areas anti-malaria medication is typically advised. Gaborone and Jwaneng in the south of Botswana are considered low risk for malaria. For the field trips 2, 3 and 5 in South Africa, only the area where the Venetia Mine is located near Musina (Field Trip 3) is considered a low risk area for malaria and covering skin with clothing, anti-mosquito sprays and lotions, and not medication, are commonly advised. Lesotho and Namibia are lower risk malaria areas. Personal Protective Equipment (PPE) will be required for each trip. Hard hats will be provided at all localities where required. Field trips participants will be required to supply their own Personal Protective Equipment. Guidelines are provided below. Some mines may require field trips participants to wear mine issued PPE such as overalls and gumboots. For this reason you will be asked for your boot and overall size when registering for field trips. For Field Trip 6: Ocean Gems in Namibia, there is an ESSENTIAL requirement for entry into the mining areas. Each delegate must carry with them and supply upon request by the mine staff, a police clearance certificate from the participant's country of residence written in English and less than one year old. Participants of all field trips are required to supply personal information such as full names, age, gender and passport numbers with expiry dates at the time of registration and a passport scan must be supplied by 01 March 2017 to the Conference Secretariat. Delegates must have their passport with them when attending all field trips to access the properties visited. The passport must match the details provided by the delegate during registration as these details were used to gain security clearance. Note that there is alcohol testing on most of the mines to be visited, typically a breathaliser. Generally speaking, you will need to stop drinking alcohol 8 hours before being tested. If you fail the test you will not be allowed to enter and will be left outside the mine.